Once again we decided to have a pretty quiet day - we packed in a lot yesterday. A foggy walk after breakfast and we were back at the Gendarmenmarkt. Google maps tells us we’re at the Deutscher Dom. Dom in German refers to a Cathedral and we wanted to check it out. It turns out (despite what we were told by our walking tour guide in 2013) that this is not a Church but rather a tower with a DOME. The two identical towers with their domes are built next to two small churches built for French (Huguenot) and German speaking Protestants in the first decade of the 1700s. The building is now under the control of the Budnestag and functions as an exhibition space for a large (and unfortunately for us all in German) detailed exhibition on the history of Democracy in Germany in the years from about 1850. Across the Unter Den Linden, through Bebelplatz (site of the Nazi book burning in 133), past St Hedwigs and the Humboldt University the and we were at Museum Island. The building works we saw last time appear to be almost finished and a new combined entrance, ticket office and museum shop of all the museums on Museum Island is nearing completion. Our stop here today was the massive Berliner Dom – this one, the church kind. Although technically not a Cathedral (Dom) because it is not the seat of a Bishop, the Berliner Dom is a magnificent building. The first church on the site was a Catholic chapel in 1451 but it’s taken 3 major makeovers/rebuilds and some pretty major style changes to get to its current incarnation which was built in 1905. Its got a really big crypt too. 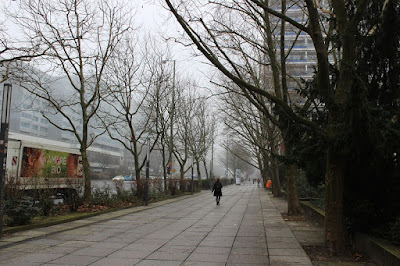 Outside again and into a still very foggy Berlin. Across the Spree and into Alexanderplatz for some lunch and shopping. It was so foggy you could hardly see the 368 metre tall Fernsehturm (TV Tower). The fog didn’t lift all day and the Berliner Dom was a beautiful sight on our way home.